Butterflies are often considered a great symbol to be used in the unfolding of a wedding, most of the times because couples think of their wedding meaning as a passage to another life, from that of a single to the life of a married couple. The same happens with the butterfly, seen in this context as the symbol of transformation that relates to the impressive process of metamorphosis that a butterfly undertakes until it reaches the maturity. This is how couples see the act of their marriage as a transformation of themselves into two grown up adults trying to work the things out in a life that will be loaded with both goods and bads. Celebrating your wedding with this symbol, you will also look to purchase one of the butterfly wedding cakes that are available with many bakery houses and many cake decorators who have outdone themselves in this field. Browsing online you will find this symbol coming in so many colors and so graciously decorating the aspect of a wedding cake that you will feel almost pity to have to cut that particular cake. But there are always the wedding photos that will preserve for ever the image of this butterfly wedding cake and have the opportunity as such to enjoy its look even more years after the wedding has already passed. 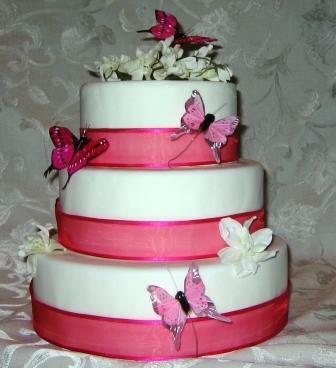 You will find butterflies cascading on the three tier wedding cake in various colors and sizes. There will be also details of green and blooming branches on which butterflies rest decorating the outside of the wedding cake tiers. You can have as well order for cake topper in the form of two butterflies to represent bride and groom – a small one colored in white (for the bride) and a larger one colored in black (for the groom).